Member of the New York State Assembly for Montgomery Co.
Daniel Cady (April 29, 1773 – October 31, 1859 in Johnstown, Fulton County, New York) was a prominent American lawyer, politician and judge in upstate New York. While perhaps better known today as the father of Elizabeth Cady Stanton, Judge Cady had a full and accomplished life of his own. Cady was born in that part of Canaan, Columbia County, New York which was later split off to form Chatham, New York. He was a son of Eleazer Cady (1745–1819) and Tryphena (née Beebe) Cady (1749–1839). His siblings included Typhema Cady (b. 1768), Zilpha Cady Halsey (1770–1858), Eleazer Cady (1775–1856), Ruth Cady (b. 1777), Sally Cady Eaton (1780–1816). Through his elder brother Eleazer, he was uncle to John Watts Cady (1790–1854), also a U.S. Representative from New York. He learned the shoemaker's trade, but accidentally injured an eye and lost the sight of it at age 18. He then studied law, first in Canaan with Judge Whiting, then in Troy with John Woodworth at the Albany Law School. Cady was admitted to the bar in 1795, and commenced practice in Florida, Montgomery County. After a year in Florida, he moved to Johnstown, then the county seat. As a young lawyer, he worked with such notables as Alexander Hamilton and Aaron Burr, and toward the end of his career, he served on a case with Abraham Lincoln, where they each represented clients in a land dispute associated with Beloit College. Cady was elected as a member of the New York State Assembly in 1808, serving three consecutive terms in the 32nd, 33rd and 34th New York State Legislatures beginning on July 1, 1808 and continuing until June 30, 1811. From February to April 1813, Cady again served in the Assembly, this time the 36th New York State Legislature, while he was also the District Attorney of the Fifth District, which comprised Albany, Saratoga, Montgomery, Schoharie and Schenectady counties. Cady was elected as a Federalist to the 14th United States Congress, holding office from March 4, 1815, to March 3, 1817. He was not a candidate for renomination and after serving in the U.S. Congress, returned to the practice of law. From June 7, 1847 to January 1, 1855, Cady was a justice of the New York Supreme Court (4th D.) until he retired and resigned. Cady also served as an ex officio judge of the New York Court of Appeals in 1849 and 1853. In 1856, Cady was a presidential elector on the Republican John C. Fremont ticket. Cady presided over the New York electoral college, which cast 35 votes for Fremont who lost the election to Democrat James Buchanan. He is considered by some the father of Fulton County, virtually engineering the county's creation in 1838 after the Montgomery county seat was moved from Johnstown to Fonda, New York. The newly established county was named after Robert Fulton, a cousin of Cady's wife. Tryphenia Cady (1804–1891), who married Edward Bayard (1806–1889), a Union College classmate of Eleazar and son of James Bayard, a U.S. Senator. Eleazer Livingston Cady (1806–1826), who died at age 20 just before his graduation from Union College. Harriet Elizabeth Cady (1810–1894), who married Daniel Cady Eaton (1804–1855), a son of Amos Eaton and brother of General Amos Beebe Eaton, and her first cousin. Elizabeth Smith Cady (1815–1902), who married Henry Brewster Stanton, brother of Robert L. Stanton, in 1840. Margaret Chinn Cady (1817–1901), who married Duncan McMartin (1817–1894), son of Duncan McMartin Jr., a New York State Senator. Catherine Henry Cady (1820–1899), who married Samuel Wilkeson (1817–1889), son of Samuel Wilkeson, a Mayor of Buffalo. His wife was an unusually tall woman for her time, had a commanding presence, whom their daughter Elizabeth described as "queenly." Margaret was said to have been emotionally devastated by the loss of so many children and fell into a depression, which prevented her from being fully involved in the lives of her surviving children. Cady died in Johnstown on October 31, 1859. He was buried at Johnstown Cemetery. 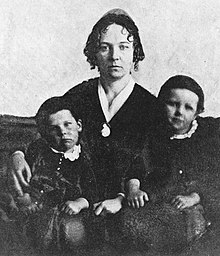 Daniel Cady's wife's sister Elizabeth, who married Peter Gerrit Smith, was the mother of Gerrit Smith, the prominent abolitionist who was married to Ann Carroll Fitzhugh. Gerrit Smith was a candidate for President of the United States in 1848, 1856, and 1860. Through his daughter Elizabeth, Daniel Cady was the grandfather of Daniel Cady Stanton (1842–1891), Henry Brewster Stanton, Jr. (1844–1903), Gerrit Smith Stanton (1845–1927), Theodore Weld Stanton (1851–1925; a prominent journalist), Margaret Livingston Stanton Lawrence (1852–1930), Harriot Eaton Stanton Blatch (1856–1940; also a suffragist), and Robert Livingston Stanton (1859–1920). Through his daughter Harriet, he was the grandfather of Daniel Cady Eaton (1834-1895), professor of botany at Yale College from the 1860s and the first Governor of the Society of Colonial Wars in the State of Connecticut. ^ a b c d "CADY, Daniel - Biographical Information". bioguide.congress.gov. Biographical Directory of the United States Congress. Retrieved 4 August 2017. ^ "Hon. Daniel Cady | New York Legal History / Antebellum, Civil War, & Reconstruction: 1847-1869". www.nycourts.gov. Retrieved 4 August 2017. ^ Stiles, Henry Reed (1893). The History and Genealogies of Ancient Windsor, Connecticut: Genealogies and biographies. Press of the Case, Lockwood & Brainard Company. Retrieved 4 August 2017. ^ a b c d e f g Allen, Orrin Peer (1910). Descendants of Nicholas Cady of Watertown, Mass. 1645-1910. author, Press of c. B. Fiske & Company. p. 92. Retrieved 4 August 2017. ^ "Descendants of Robert Livingston and Alida Schuyler". www.iment.com. Retrieved 4 August 2017. ^ a b c "DANIEL CADY. ; Biographical Sketch of the late Judge Cade--Outline of his Professional Career" (PDF). The New York Times. January 25, 1855. Retrieved 4 August 2017. ^ a b c Hough, Franklin (1858). The New York Civil List: containing the names and origin of the civil divisions, and the names and dates of election or appointment of the principal state and county officers from the Revolution to the present time. Weed, Parsons and Co. Retrieved 4 August 2017. ^ Raymond, William (1851). Biographical Sketches of the Distinguished Men of Columbia County: Including an Account of the Most Important Offices They Have Filled, in the State and General Governments, and in the Army and Navy. Weed, Parsons and Company. Retrieved 4 August 2017. ^ a b Frothingham, Washington (1892). History of Fulton County: Embracing Early Discoveries, the Advance of Civilization, the Labors and Triumphs of Sir William Johnson, the Inception and Development of the Glove Industry; with Town and Local Records, Also Military Achievements of Fulton County Patriots. D. Mason. Retrieved 4 August 2017. ^ "Obituary. | Death of Hon. Daniel Cady" (PDF). The New York Times. November 3, 1859. Retrieved 4 August 2017. ^ Back to Africa: Benjamin Coates and the colonization movement in America. Penn State Press. 2005. p. 88. ISBN 0-271-02684-7. ^ "Yale Peabody Museum of Natural History: Daniel Cady Eaton". Yale.edu. Retrieved 27 February 2014. ^ "The Society of Colonial Wars - The Connecticut Society". colonialwarsct.org. Retrieved December 13, 2017. United States Congress. "Daniel Cady (id: C000014)". Biographical Directory of the United States Congress.